Here’s something that ought to keep the Tower Club management up at night: the exclusive Fort Lauderdale establishment has never really appealed to those who live downtown. Consider what that means. All those young professionals living in the downtown towers, all those condo dweller bankers and lawyers, are an obvious base for membership. It’s a point not lost on the club’s corporate owners, which is why they’ve recently finished a complete renovation. No, wait, not a renovation, they say, but a complete rethinking of the place. “We weren’t as fun as we are going to be,” says Michael Rosa, the club’s general manager, who noted the lack of a downtown resident during a recent tour. When Rosa took over running the club in 2012, the average member age was 55. Now, it’s 47, and he expects it’ll keep dropping. The only way to ensure the club survives, he says, is by bringing in younger members while also keeping the old-guard happy. The club hasn’t changed much since the late newspaperman Fred Pettijohn helped found it in 1974 on the 28th floor of what was then the city’s tallest building, now called One Financial Plaza. A decade later, Dallas-based ClubCorp took over management and added it to the 150 business and country clubs it now runs. Since then, Rosa says it has grown 140 percent, to 1,600 members. Those members pay $198 a month, or $168 for the under-40 crowd. The post-modern redesign is meant to evoke the club’s history while also feeling renewed. Fresh touches include starburst light fixtures, Swedish-style furniture, and a mix of gray carpet and wood-grain tiles. 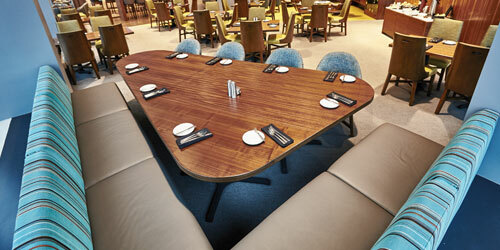 The most notable change is the new lounge, with a marble bar, a long communal high-top, and a scattering of tables and chairs; a cocktail counter converts into a foosball table, and an 80-inch TV will show games. The lounge now hosts liquor tastings and offers high-end wines not found by the glass at most restaurants, like the $200-a-bottle Caymus Special Selection. The sprawling member dining room, with downtown and ocean views, becomes the Union Exchange Ballroom, available to rent for events and open to members during special occasions. A smaller room in the southwest corner that used to hold special events becomes the member dining room. Rosa hopes the newly designed club will become Fort Lauderdale’s 30-minute power lunch of choice. At night, the menu changes to a family-style concept, with big platters to share. And if all turns out as planned, some of those members will include downtown young professionals.